Dhaka, Feb 1 (Just News): A defence lawyer in the Shaheed Ziaur Rahman Charitable Trust case on Thursday told a special court in Dhaka that Anti-Corruption Commission had no jurisdiction to lodge the case as the trust was a private one. Bangladesh Nationalist Party chairperson and former prime minister Begum Khaleda Zia, her former political secretary Harris Chowdhury, his former personal assistant Ziaul Islam Munna and former Dhaka mayor Sadeque Hossain Khoka’s assistant personal secretary Monirul Islam Khan are the accused in the case. Khaleda Zia, Ziaul and Monirul who are now on bail, were in the court. Harris is still in hiding. Advocate Md Aminul Islam, who represented Ziaul in the case before the Dhaka special judge’s court-5, while wrapping up his third day’s arguments defending his client, told the court that not a single prosecution witnesses had complained to ACC that any of the accused had taken money from any individual or institution. He submitted that as the trust was a private one and there was none to complain about taking money, the ACC had no jurisdiction of lodging the case. He submitted that the prosecution had claimed that the charitable trust was established in 2005 but it was originally established in 1993 and its first account was opened in the Fakirapul branch of Sonali Bank Limited. As the then trustees, including former president AQM Badruddoza Chowdhury, Abdul Matin Chowdhury and former foreign minister Mustafizur Rahman, either left the party or died, the trust was needed to be reformed in 2005, he submitted. In fact, he argued, the 2005 trust is a continuation of the 1993 trust and an account was then opened in the PMO branch of Sonali Bank in 2005 for operating the transactions of the trust. He submitted that the prosecution witness number 33 and investigation officer of the case, Nur Ahmed, during cross-examination had told the court that Suraiya Khanom, from whom a piece of land was bought for the charitable trust, received Tk 1.24crore as the cost of air conditioner, fittings and other establishments on her land. So, the prosecution’s claim of giving an extra amount of Tk 1.24 crore to Suraiya Begum was baseless, he submitted. He also said that the prosecution had alleged that there was nothing visible of the trust but, the prosecution evidences showed that there was 42 kathas of lands, bought in 2005, and other establishments there. He also sought to discredit the IO. His arguments remained incomplete when the court adjourned the proceedings of the case and set February 25 and 26 for hearing further arguments in the case. Though the court generally hears the cases against Khaleda three days a week, the court adjourned the proceedings of the case for 24 days responding to ACC lawyer Mosharrof Hossain Kajal’s prayer saying that the movement of the former prime minister might affect the Secondary School Certificate examinees. ACC lodged the case on August 8, 2011 with the Tejgaon police for raising funds of Tk 7.77 crore for the trust abusing their power during Khaleda’s tenure as the prime minister between 2001 and 2006. Dhaka special judge’s court-5 is set to deliver its verdict in the case of Zia Orphanage Trust case against Khaleda, her son Tarique Rahman and four others on February 8. 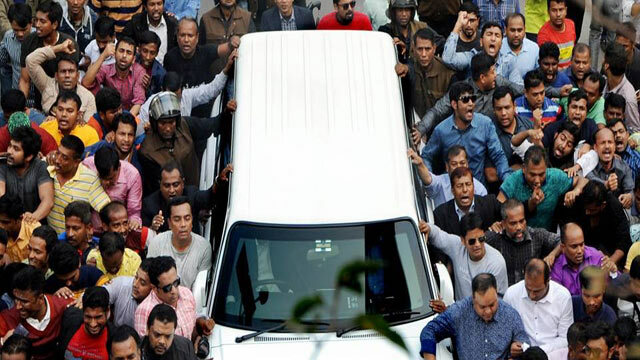 While returning from the court, Khaleda’s motorcade changed its usual route to go to her Gulshan residence. Chief coordinator of BNP chairperson’s security forces Muhammad Ishaque Mian said Dhaka Metropolitan Police’s Ramna zone deputy commissioner, after the court hours, requested them to go to Gulshan via Phulbaria-Kakrail road for the day instead of via High Court that they generally used. Deputy commissioner Maruf Hossain Sordar told that they requested to change the route to ease prime minister Sheikh Hasina’s movement for inauguration of Ekushe Book Fair on Bangla Academy premises.